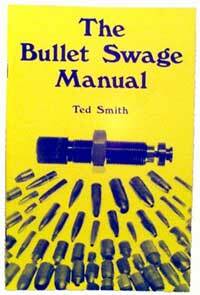 The Bullet Swage Manual is the first book about bullet swaging, written by Ted Smith of SAS Dies in the 1960's and published by Corbin. It is a historical work with many photos of early Corbin and SAS products. It remains unchanged in tribute to the pioneer of popular swaging and inventor of the powder trickler called the "Little Dripper".